Take one look at these bizarre and flamboyantly colored creatures, and you might assume that—like many of the planet’s most striking butterflies and moths—they hail from a tropical forest teeming with life. But this cast of caterpillar characters actually inhabits backyard gardens, city parks, and suburban woodlots across the eastern U.S. The 10 species represented here are just a small sampling of the astounding variety of caterpillars found in these close-to-home habitats. Each possesses its own set of traits—colors, shapes, behaviors, and weapons—that helps the caterpillar survive in its environment. Predators have driven the evolution of many of these characteristics, weeding out individuals that lacked sufficient defenses. Generation after generation of natural selection has given rise to caterpillars that mimic fallen leaves or raindrops, species with eyespots that scream snake, or bright hues that warn of poisonous spines. In most cases, the adult forms of these species are much less conspicuous than their larvae, which may be why these evolutionary marvels have largely gone unnoticed and unappreciated—until now. With its bright green markings and menacing clusters of venomous spines, the aptly named saddleback slug caterpillar (Acharia stimulea) sends a clear message to would-be predators: Stay away. Each of the caterpillar’s hollow spines delivers a potent venom that can debilitate even well-armed aggressors such as assassin bugs and paper wasps. Among humans, the more severe reactions include migraines, hemorrhaging, asthma complications, and anaphylactic shock. 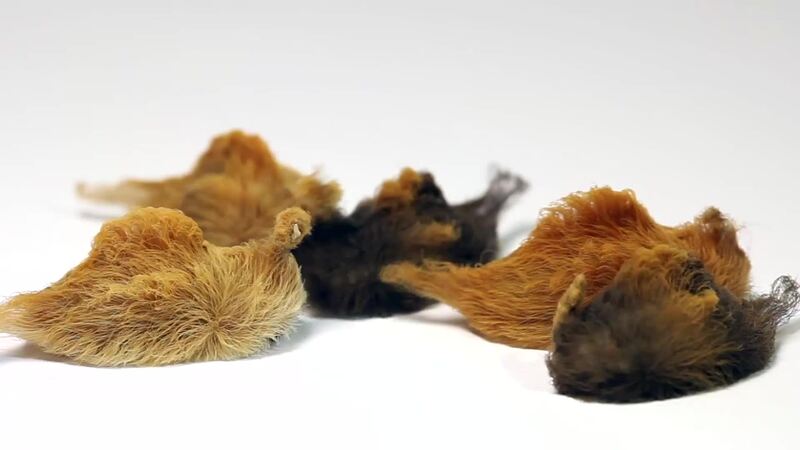 It’s no surprise that these fuzzy caterpillars have inspired a plethora of cuddly nicknames. While the adults are most frequently referred to as Arizona flannel moths (Megalopyge bissesa), the larvae are known as puss caterpillars, possum bugs, woolly slugs, and perritos (Spanish for puppies). But don’t be fooled by these friendly names. 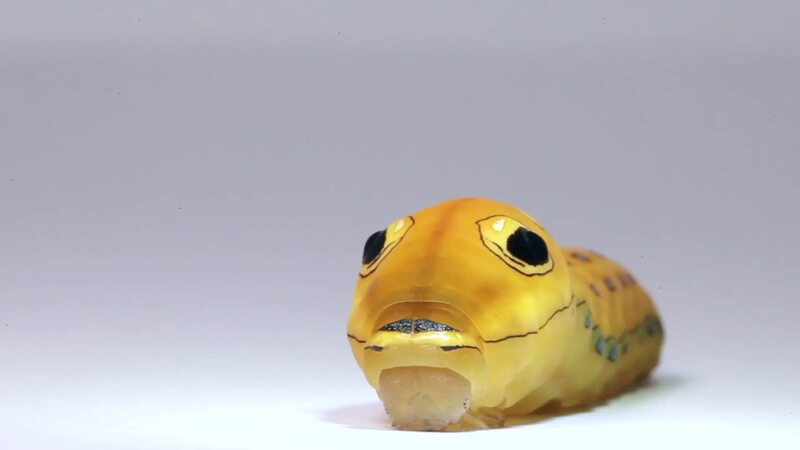 Beneath their soft golden hair, these caterpillars are armed with sharp spines that can inflict one of the most excruciating stings of any North American caterpillar. Masquerading as a leaf, the skiff slug caterpillar (Prolimacodes badia) is easy to overlook in its forest habitat. Splotches of white and brown along its sides mimic leaf damage or decay, making the disguise all the more convincing. 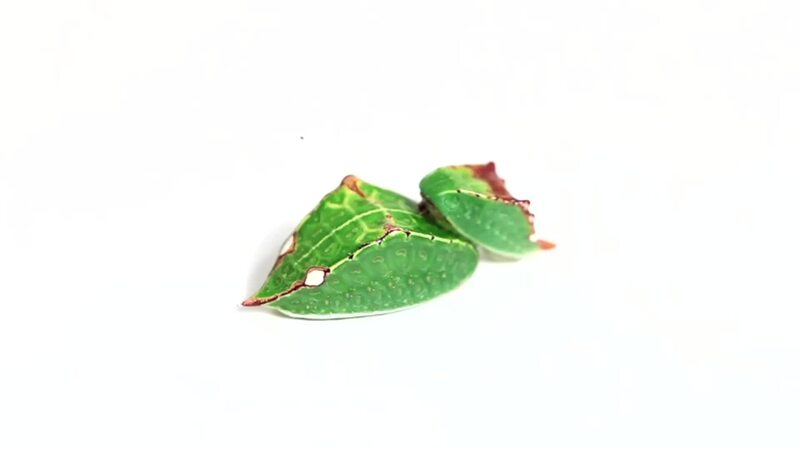 Most skiff slug caterpillars live out their larval lives on the undersides of just a few individual leaves, munching on species like oak, black cherry, and poplar until they construct cocoons and mature into delicate brown moths. As an adult, the delicate, black-and-blue-winged spicebush swallowtail butterfly (Papilio troilus) is anything but intimidating. But the caterpillar is another story. Its big, black eye spots help the large caterpillar pass itself off as a snake (at least at first glance), keeping most birds and other menacing creatures at bay. Caterpillars commonly use mimicry of predators—snakes, frogs, or spiders—as a strategy for staying out of harm’s way. This yellow mimic patrols woodlands across the eastern U.S., sheltering in leaf folds by day and feeding voraciously on leaves at night. The outlandish monkey slug caterpillar (Phobetron pithecium) haunts shade trees and ornamental shrubs, such as roses, dogwoods, and alders, across the eastern U.S. Although the fleshy appendages along its sides look a bit like legs, they don’t actually aid in locomotion. Instead, they help the caterpillar disguise itself as a big, hairy spider. 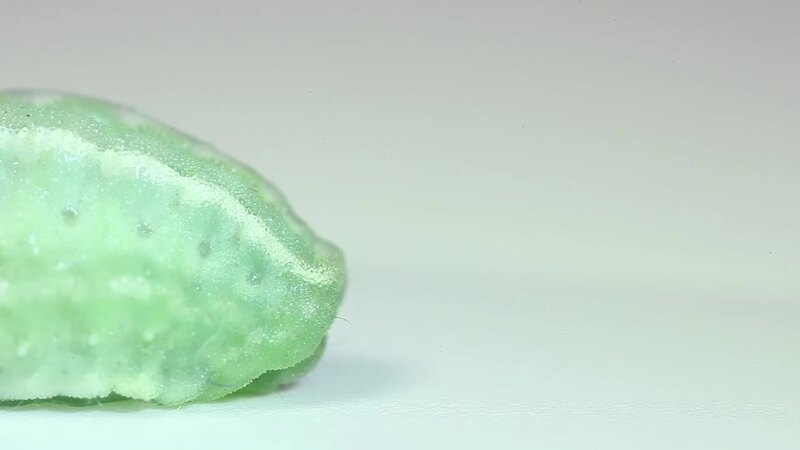 If this deception isn’t enough to keep potential predators away, the caterpillar has a backup defense: Some of its hairs are hollow and connect to venom glands in its skin. 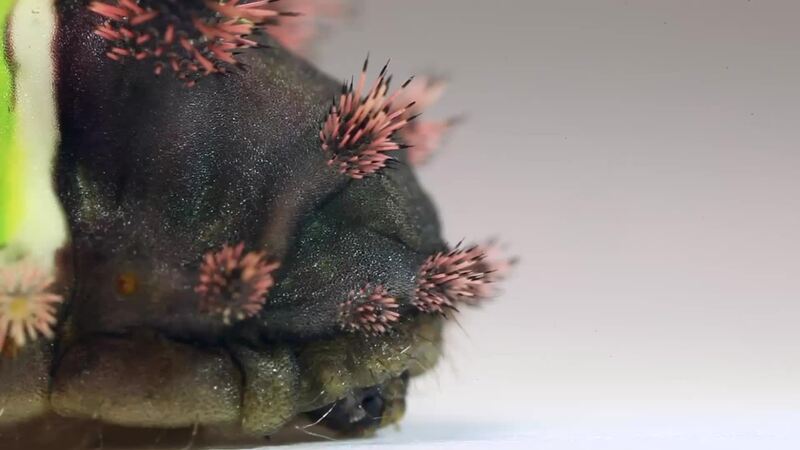 Contact with these tiny spines creates an itching, burning sensation that feels like a bee sting. 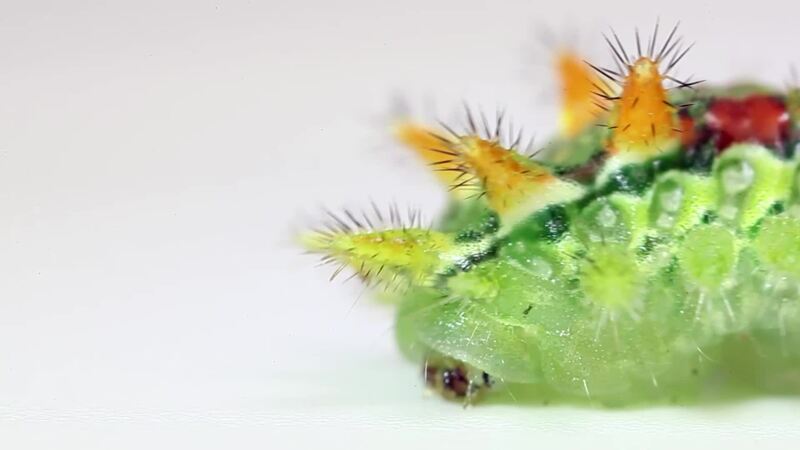 With its kiwi-green body and tangerine- and pomegranate-hued horns, the spiny oak slug caterpillar (Euclea delphinii) has come to be known among the bioGraphic editorial staff as the fruit salad caterpillar. 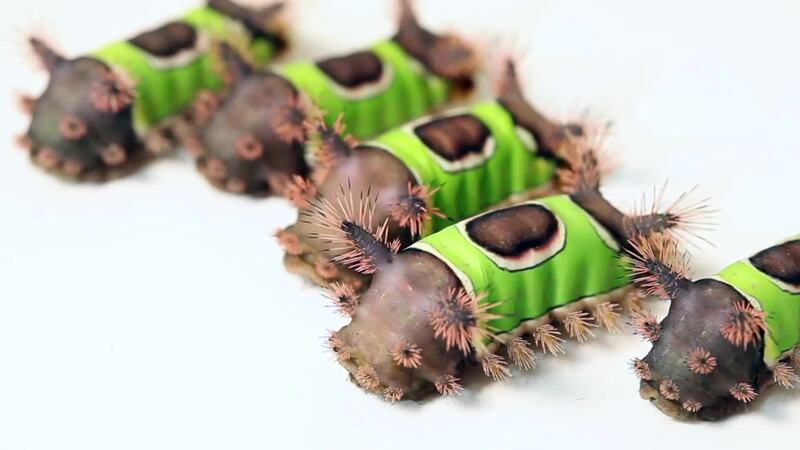 Like other slug caterpillars—there are about 1,000 members of the family Limacodidae, including seven in this collection—this technicolor species has a distinctive method of travel. Without defined legs, the caterpillar undulates its body to move. A series of abdominal “suckers” help it maintain traction as it worms its way across the surface of leaves. 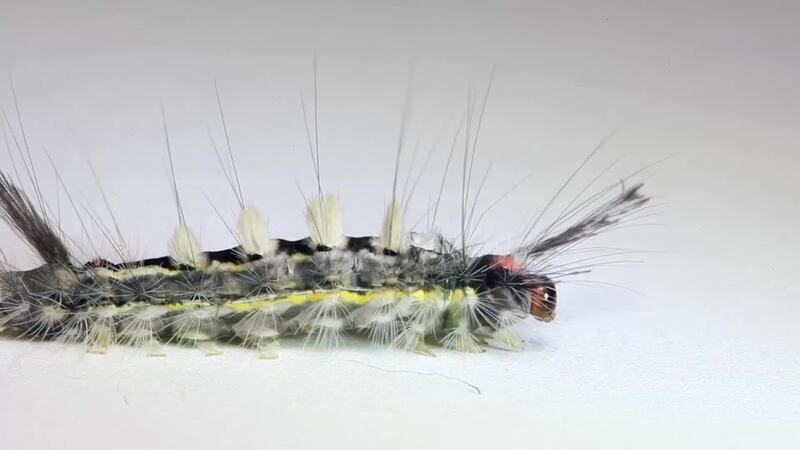 As this white-marked tussock caterpillar (Orgyia leucostigma) molts, it reveals hairs of varying length and diameter, each with its own defensive purpose. Tall hairs physically block potential predators; stouter bristles with protruding barbs tangle the spindly legs of ants and wasps; and the dense clumps of short hairs along the caterpillar’s back deliver a toxin that can cause allergic reactions in birds, frogs, and other larger predators. Sporting bold, tomato-red stripes, the stinging rose slug caterpillar (Parasa indetermina) couldn’t send a stronger warning message to potential predators if it tried. 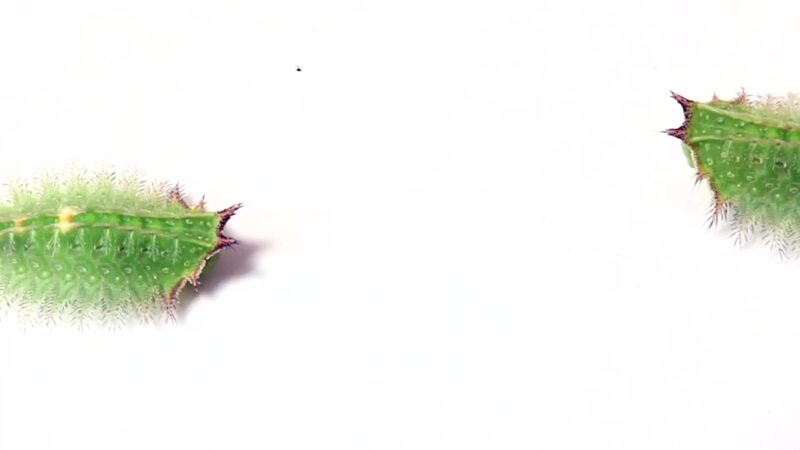 The caterpillar’s traffic-cone-like appendages are armed with venomous spines that render the stinging rose a challenging meal for even the most hardened of predators. In late summer, these prickly beauties can be spotted brightening a variety of deciduous trees, including apple, cottonwood, hickory, oak, and sycamore. The crowned slug caterpillar (Isa textual) doesn’t rely solely on its shape and verdant hue to blend in with the surrounding foliage. 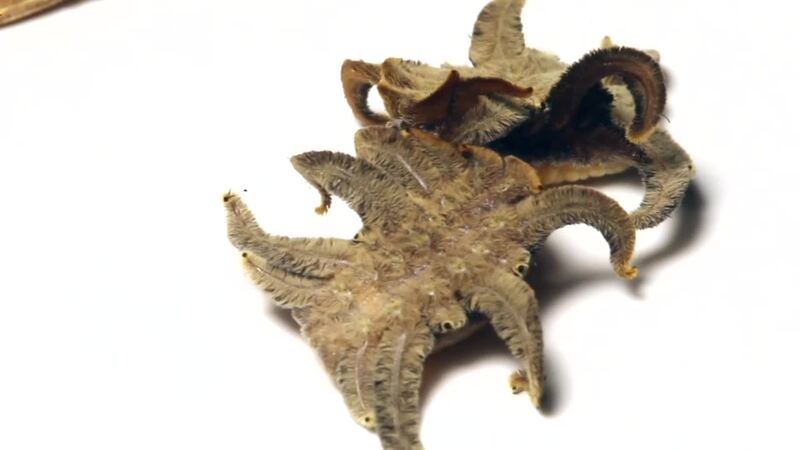 The pale bumps along its back resemble the late-season scars and fungal blemishes found on many of the leaves it eats, including oak, cherry, maple, and beech. As an added defense, individuals are rimmed with a venomous crown of sharp spines, enabling these caterpillars to feed in peace. Hardly recognizable as a caterpillar, the jeweled tailed slug caterpillar (Packardia geminate) slinks across leaves like a glimmering raindrop. Lacking venomous spines, vivid warning coloration, or extravagant mimicry, this species simply relies on going unnoticed. 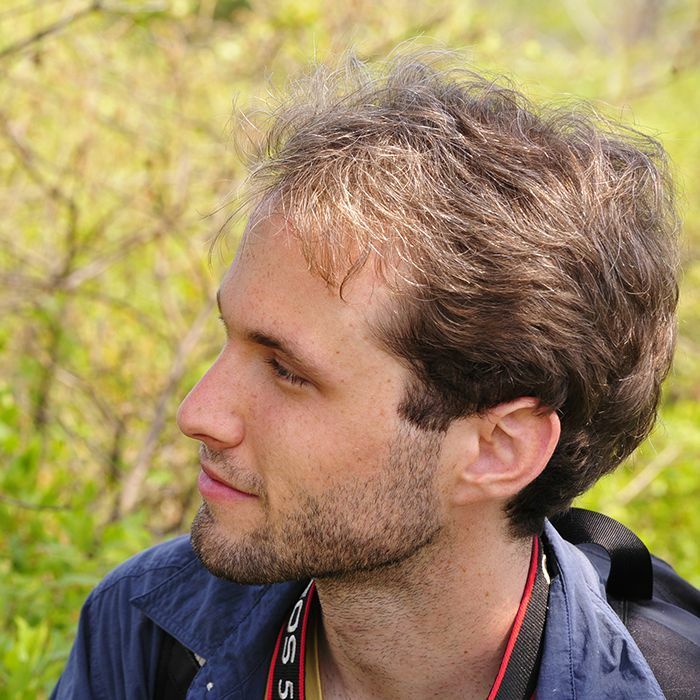 Samuel Jaffe is a New England-based naturalist, photographer, and educator. For the past 10 years he has been photographing caterpillars and organizing programs to promote these special creatures to the public. In 2013, he founded The Caterpillar Lab, a non-profit educational outreach organization. He now travels across the country to work with museums, nature centers, schools, and teachers, and help native insects find their place in our daily lives. Find more Caterpillar Lab videos at www.facebook.com/thecaterpillarlab.